Having seen Agathon and various others using an airbrush I began to develop a bit of a keen interest in getting meself one too. I just got my hands on FW's modelling masterclass book and I see they too recommend I get one, but funny enough they don't recommend the GW one. I figured if you're gunna do something, do it proppa, and maybe a can of propellent ain't really all that proppa? So I got to looking online for a reasonably decent one, trouble is I've never bought one before and feel like a blonde in a tool shop searching for spirit level bubbles I did find this site but as I said, I dont really know what I'm looking at Can anybody suggest a good type, make, model or anything at all really? It all depends on what you want to spend. I purchased a double action air brush. Typical single action are less expensive, but then you also get less control. double action - when you push the button you just get air, then you pull back on the trigger as well and that releases the paint. The double action trigger is a little tricky getting used to, but if you buy a good airbrush for this hobby, it will last you for years. The Forgeworld Book says to buy the best one you can afford... and they're right. I did a hell of a lot of reading on these things before I committed to mine. First up when doing an airbrush, you're not just getting the airbrush, but you're also getting a compressor if you want to make it work. The compressor will make up about 2/3's or more of the cost of your airbrush purchase. In my case, I already had the GW spraygun, which is effectively a single-action syphon-feed airbrush shaped like a flamer. The cans are really unreliable as an air source... and I found that out very quickly. Even so, the GW spraygun was enough of a taste for airbrushes that I decided to forgego models in favour of a new and very powerful painting tool. 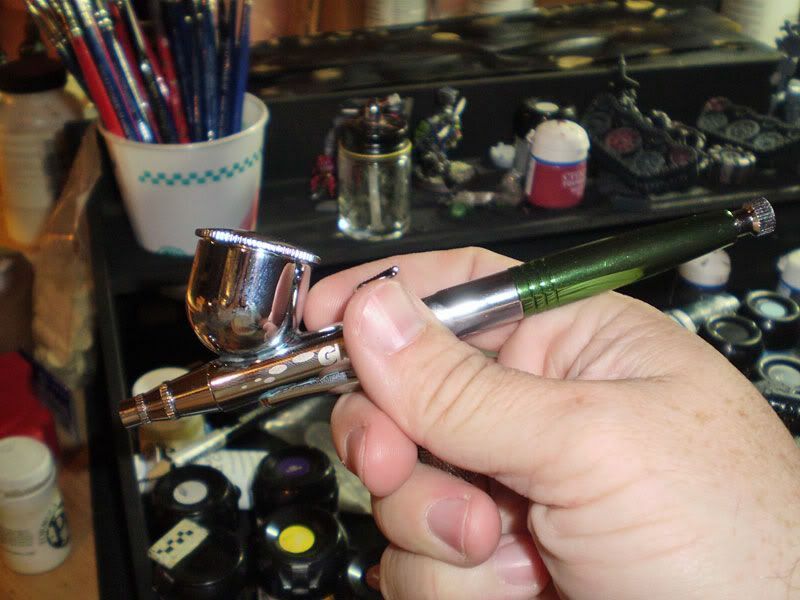 There are 2 general types of airbrush on the market: Single action, and dual action. Within each type there are syphon-feed (from the bottom), and gravity-feed (from the top) as to how paint actually gets into the airstream. In my case, I purchased a dual-action gravity feed airbrush, with a cup on the top of it large enough to hold about 7mL of paint. The brand I chose is a less well known one from a company called "Grex" -specifically the Genesis XG, as well as the compressor designed to go with that airbrush. Of the page you linked to, the brand I am most familiar with is the Iwata. They are considered to be the best and most available of all the airbrushes. My Grex airbrush and compressor is actually compatible with the Iwata ones... but Grex is harder to find. And the third item down on the list, AB-AS-18 Airbrushing kit with the Iwata Eclipse CS is pretty good, and is similar to what I have. It's a dual-action gravity feed. The cost on that kit is roughly similar to what I paid for my stuff on sale. From what I understand, Iwata brushes are in many ways the industry standard for quality. Badger is more common a brand, but most of their stuff is entry level. The one thing I've learned very quickly... cleaning your airbrush will be something you will become VERY familiar with. You will likely spend as much time cleaning the brush as you will be painting with it, but since it cuts your painting time down incredibly, especially with vehicles, that's a fair trade. It's really not that onerous. Once you have the airbrush, then it's about learning techniques. I can give you some references for that later, because until you put the brush in your hand it won't make a lot of sense. thanks for this thread, I have been mulling this same thing around in my mind for a good bit now and I thinkI am ging to start doing the research. Gizzus me Shoota, we iz off to bust sum 'oomies! there's some great responses here I agree it's definately a good idea to buy the best you can, although that should be clarified by saying there's no point buying a very expensive brush if all you are just planning to use it for very basic stuff! (ie. dont get an extremely expensive brush if you are just looking to basecoat vehicles) another important thing, is to buy an airbrush that you can easily get replacement parts for (especially needles, as they are very fragile and any bends will make them unusable) I would suggest getting a gravity feed airbrush, as it is far less likely to waste paint (as with a suction feed you need to have the paint filled up to a certain line in order to get paint flow (a lot like handwash dispensers, once they start to run low its very hard to get much handwash out) It's very important to get a good compressor, as even the best airbrush with an unreliable air source will produce crap results. as britain is a damp country, I would say that it's very important that you get some kind of moisture trap. extra water coming in through your air can mess up your paint mix. I recently purchased an Iwata brush from airbrushes.com I would definately suggest them as they have a great range of products and replacement parts, good speed of delivery, and when you get membership you get 10% off your first order (which considering your first order will generally be your airbrush and compressor, that can be a considerable amount off) hope this helps! How loud are the compressors? I do most of my work at night after everyone's asleep. I don't want to wake up the whole house while I paint my tanks. I can't speak for the Iwata compressors, but the Grex 1810-A is very quiet, and only runs when it needs to. The 220V version is called the 1810-B... There is some wisdom in getting a brush that you can easily get parts for. I'm on my second needle already for my Genesis XG, and I suspect that even being careful with it I may need to get a third before the year is out. Even so, be careful with the needle... I sometimes airbrush with the nozzle cover off to get in very close. Compressors are LOUD. You may want to look into a compressor and tank, or a refillable tank. I’ve had the same airbrush for 17 years. Over the years, I’ve probably painted 12 40K and WFB armies (could not afford to do half that nowadays), and various other stuff like titans. I’ve probably used the airbrush 8 or 9 times, ever. I like it, it’s fun to use, but… Unless you are vehicle happy, you will probably find that the time you save base-coating figs with the airbrush doesn’t really justify the process of setup, getting the paint right, spraying, and clean up. It’s just easier to pick up a brush. Yes, I can prime a unit of ten beakies, and then I can base coat them with the airbrush, all very quickly. I did that a few months ago. Nice, consistent coat. Looks good. I don’t know, maybe I saved some time. I do know I would not buy an airbrush just to do that. Now, vehicles are another story. For any kind of cammo patterns, airbrushes are great. That’s why they are popular, they can paint up Tiger Tanks and F-14 Tomcats much better than most anyone can do by hand. Ironically, I gather that Flames of War types don’t use airbrushes much; because their vehicles are small, and they can get the results they want by hand. Again, if you are going to basecoat a couple of Rhinos and a Land Raider Ultramarine Blue, the airbrush is OK. Then it goes in the closet for years. What I am getting at is airbrushes are fun, and can do some very cool things. I used one to paint up 3 panzee Falcons with a beautiful light to dark blue fade pattern, and then the airbrush went into the closet for years. I last used it to wash my Stompa with water-based Minwax wood stain (too big to dip). Not sure I would recommend that, the wash is too consistent. But, the latest thing I painted was 10 Meganobs. I primed’em, then base coated them Gunmetal. I just didn’t bother with the airbrush, slapping on the paint was easier. Bottom line, cheap airbrushes and propellant cans are a pain and can be frustrating. You can do some cool stuff with a good airbrush and a reliable air source. But, if you really only need to basecoat figs and few vehicles, you are not going to find an expensive airbrush is a life changing purchase. I would never tell someone NOT to buy and airbrush, it might become their favorite tool. But, for this hobby, I would never tell someone they really NEED an airbrush, either. I can understand why a number of members are suggesting single actions, or even not getting a brush, but in the case of phatty, he's mentioned the forgeworld modelling book, which to me means he would like to try one out on the basis of giving the techniques in the book a try. For that and for any real mucking about you would want to do for the scale/results you want, a double action is the only recommendation I can truthfully make. Yes, no one ever NEEDS anything really, but it definately is a tool that will add all sorts of efficient, possibly weird and, fun techniques. Sorta like graduating from running, to getting onto a bike. It cannot replace a bristle brush with what it can do, but there are some things you can't easily achieve with bristles that are par for the course with an airbrush. Keep in mind that not all compressors are loud. I've a few friends who airbrush in HK(Actually, I think I know more modellers here who airbrush than brush brush, but then HK has quite the number of "garage kit" and gundam modellers for whom the airbrush is the only real alternative(the size of the models and the typically large smooth surfaces involved makes hand brushing rather less effective. My older testor's compressor reminds me of a small boat motor, or maybe a scooter on idle. The thing rumbles and makes enough noise that I don't use it at night to make sure I don't bug the neighbours. While it doesn't make so much noise that you'll bother someone a room and a half down(honestly, you don't really notice it outside of the room, but better safe than sorry). The newer pumps I've seen tend not to be as noisy, with some silent as an electric fan(albeit a noisy electric fan...). If noise is a big issue, and you can get a hold of one, you could try to use a scuba tank for your air source. They don't cost much to fill, and the air you get will be dry(eliminating the need for moisture traps. They're not cheap, but not particularly pricy either, and a tank will last you pretty long. Just keep in mind that you'll be lugging one of these back to the shop every so often, and they are fairly heavy. On the bright side, they're dead silent, so no one can ever complain about the noise(unless they're complaining about the noise your airbrush makes while spraying...). The big problem is I'm not too sure if you can find decent support for a tank run airbrush, as it isn't exactly common. But if you absolutely need silent operation, then this is a good bet. I'd still recommend a quiet compressor over a tank due to the maintenance/etc. I'm surprised in terms of the comments around compressor noise. I know that some can be quite loud, but the unit I have is an artist's compressor, and is very quiet. My wife and I have hobby stations next to each other, and my compressor doesn't bother her at all. She can hear it, but it runs quietly. I've heard of some compressors that can wake the neighbours. The artists compressors that are out there these days are intended for "discreet" use. I think that's part of the technology improvements, but the Grex 1810-A and B models are quite quiet. They also come with the pressure gauge and water trap. I use that a lot... I believe the Iwata artist compressor is also pretty quiet as well... I'll go do some research. edit: I did a quick check in terms of decebels (dB) of my compressor is about 60-65... which is about the same loudness as a conversation, but quieter than a coffee grinder. Iwata makes excellent airbrushes for a decent price(excellent quality for the price). Properly maintained you’ll not likely need another unless you get really serious about airbrushing all kinds of things (or get in the habit of using different types of paints). Many people have separate airbrushes for clear coats(so that they never become "tainted" by stray metallic flake in particular), one for metallics, one for enamels or lacquers, etc. The Iwata HP-BCS has a huge 2 oz. paint reservoir (cup), but you will notice that it will spray anywhere from as fine as a human hair to 2” round spray patterns. Very versatile. There is also the Revolution series, which is also good. You will note that it is very similar to the Eclipse series. The Revolution CR is the less expensive model of the Eclipse HP-CS, but the quality is not cheap at all. The spray pattern simply doesn’t go quite as fine or as large as the Eclipse series equivalent, though the pattern is still very good, having a range from 1/16” /1.75mm at its finest to 1.5”/ 38mm at its broadest. There is also the Revolution BCR, which is kind of a less costly version of the Eclipse HP-BCS. One important thing to note about all four of these airbrushes is that they are dual-action airbrushes. The dual-action refers to being able to control both air flow AND paint flow. This is particularly useful for blending. You want a fine misting of paint, then increase the air flow and keep the paint flow low. It takes some practice to do this well, but you can get some great results. Iwata also makes a great compressor that is near silent for you apartment dwellers or those who have a spouse not keen on the usual noisy(and large) garage style air compressors. The Smart Jet is a great compressor, with some great features. It is small yet still more than powerful enough for airbrushing little army men and their tanks, or bugs and their bigger bug friends. The Sprint Jet costs a bit less and is still a good, quiet compressor. The Silver Jet model is the entry level model. It is not quite a powerful as the others, but is more than adequate for hobby applications. That is what it is made for after all. Also, most paints require thinning to be used in an airbrush, and never just pour the paint into the airbrush reservoir (cup) straight from the paint bottle. Premix and then fill. The paint should be about as thick/transparent as 2% milk. That might seem kind of thin, but trust me, it is just right. Regardless of what brand of airbrush you settle on, make sure you look over the airbrush’s features before buying one so that you know it will do what you want it to. And make sure you clean your airbrush THOUROUGHLY after using it, EVERY TIME. Trust me when I say that using weird cleaners to get dried paint out of your airbrush so that it doesn’t spit and splatter paint like a feral cat is no fun at all. Always test your paint flow for spattering and spitting before you point your airbrush at a model. Just spray it on a piece of white paper you have handy. If it spits and splatters rather than sprays finely then either your airbrush is dirty(clogged with dried paint, a hair, etc.) or the paint you are using has not been thinned enough and is itself clogging the airbrush. Clean the airbrush or thin the paint as needed to fix the problem. Sometimes an o-ring inside of the airbrush assembly can be improperly installed after cleaning and re-assembly which can cause problems. Make sure the parts go together smoothly when reassembling your airbrush after cleaning. I think that covers most of the bases. Shabbadoo speaks much wisdom. His words are wise. His airbrush-fu is strong. My perspective is still very much in the "gee whiz I have an airbrush" stage... I had some spraying issues with mine last night, thinking that I'd have to replace the needle... instead I discovered that a tiny particle had lodged itself in an area that I had neglected to clean, throwing the aim and distribution of the paint. Once I cleared it, it sprayed perfectly... To be honest, I couldn't even see the particle that was there, but it was enough to throw things off. I'll throw my $0.02 into this discussion... mostly to second points already made (lots of good info here already). I have an Iwata Eclipse (forget which one, just the regular bottom feed one, pictured below). It goes for about $150 cdn these days. I've had it for almost 11 years now, and have only replaced two parts in that time. As mentioned, having access to replacement parts is a great thing... I can get whatever I need at Curry's art store (a great source for anybody in the greater Toronto (Ontario) area). After purchasing it I got a couple little cups (also pictured below). When I bought it I thought the large bottles would be better, but for models this isn't the case. When I was in university I did some set painting for stage productions, and the big bottles came in handy there. As mentioned, you typically use very little paint when doing models, so mixing up enough for a bottle is a waste. If I were to do it again I'd get the type with the cup built in and above (as in Agatheron's pic). I have a badger compressor. Its small and portable, but if I have the option I prefer to use a normal compressor (with a tank and pressure regulator). A couple reasons for this... 1) my small compressor only runs at one pressure (I like to be able to adjust this for different thicknesses of paint). 2) I get condensation problems with my small compressor. I have an inline condensation trap, but it doesn't work. I find I get less condensation when using a larger compressor. 3) My little compressor goes on and off every time I spray, and this gets a little annoying. A larger compressor, while loud, cycles less frequently because it builds a lot of pressure at once and I'm only drawing it off at 15-20 psi. I also find that I get a lot less condensation when using a compressor. I think this is because the air will cool while under pressure and this helps with the thermodynamic phase changes. I've never used the propellant cans, but I hear they are expensive and unreliable. As mentioned, cleaning your airbrush is #1. This cannot be stressed enough. Because of this I usually discourage people from the airbrush purchase. Unless you have tried one out and seen this first hand I don't think people understand how much of a job this can be. Over the years I've had lots of issues with cleaning it out, and know it inside out. I've used harsh cleaners (Acetone) and ruined the o-ring, had it gum up, spatter paint and everything else. I know I'm a bit lazy in this department, but there aren't really any short cuts here. Currently I find rubbing alcohol works well as a cleaner... and its cheap. I have it in an old contact lens fluid bottle because it has a nice nozzle (its the bottle in the background below). Using proper paints will help a lot with cleaning. I have a bunch of airbrush specific paints and these thinned down with airbrush medium (I use liquitex stuff, but most brands have their own). Tamiya paints are fantastic, and thin down great with isopropyl Alcohol but I don't like pouring them from those bottles. I'm hoping to give reaper paints a shot soon. They would be the preferred option (for me) because of the eyedropper bottles. All that said, its a great tool, and you can get some amazing results, but it takes practice and patience. It will be one of your more expensive hobby tool purchases, so do it wisely. If you can, find someone to show you one and how it works. Take lessons if you can. I was fortunate enough to have access to one at high school, and knew what I was getting into with that experience. Here's a better picture of the cup that fits in bottom feed. These are decent, but a little bit of a pain to clean. Due to having no GW store where I live, asking people and seeing how airbrushes are used/maintained is nigh on impossible. Even though it'd probably be the best way for someone like myself (a self confessed novice) to understand. It seems to me that none of you have the GW airbrush, and all have like "pro" ones and loads of experience with using airbrushes. Is it because the GW one is rubish? or is it just that, whilst basing and washing models the GW (or similar cheap 'n' cheerfull ones) will do you, for finer details and different coat thickness' you need a slightly better one? I just ask because like Phatty I'm interested in getting one (due to having 100+ 'umies and 60 ork boys left to paint...) to base/wash models quickly before doing finer details by brush. I also have no clue when it comes to airbrushes, so the talk of thinning down, compressors and having to spend ages cleaning them is kinda confusing! So, for simple basing/washing of a load of models, will a cheap/the GW airbush do? and do you need to thin paints down, get a compressor e.t.c. if you're just basing/washing models to save time? Oh, and does it save time when doing tanks and horde mobs? because I've heard different opinions on this. you all sure know your stuff on here!